With 25 years of experience our reputation means everything to us and we ensure that this is maintained throughout every job we take on – We do not use outside contractors and all our Team are fully trained and follow the ISPE (Institute of Swimming Pool Engineers) regulations. We are happy to help you through every step of the way, from initial design ideas through to completion, and can add our expertise to often save you money and avoid common mistakes. You can rest assured that you are dealing with a very well respected company that has in-depth experience in all aspects of Swimming Pools, Spa’s, Hot-tubs and associated products. Our flexible, practical and friendly approach combined with our attention to detail and excellent service means that our customers return to us for all their swimming pool requirements. In addition to above, we have won awards for previous swimming pool projects undertaken – recognition for all of our hard work on every project we take on. Why not call us on 01293 881340 to talk about your pool. I have been in and around swimming pools from the age of five years old when my father who was one of Gilliams top marbeliters used to take me along to help out my busy mum. Gilliams were one of the biggest swimming pool contractors back in the sixties and would get my dad, who started out as a plasterer, to do their finishing after some local builder constructed the pool. He got so tired of having to put right the construction prior to the finishing that he asked if he could oversee the building of the pools himself. This he did, and soon he was constructing the pools and finishing them. I can remember being wheeled around in a wheel barrow and being fascinated by the coloured mosaic tiles, all of which would have been from the only supplier at that time Udny tiles. 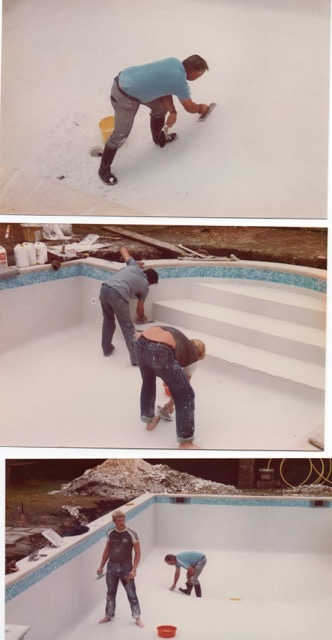 It was no surprise to my family that I would go into the pool business and you can see from the photo of me at the age of 15 I fitted right in. Over the years I have worked on and constructed hundreds of swimming pools and spas so there is not a lot I haven’t seen. What I have learnt from my many years involved with swimming pools is to not under estimate the weight and power of water – to take short cuts with many tons of water is unwise, so always make sure things are done properly. If you have any questions regarding pool and spa construction feel free to ask.